There’s quite a bit of truth to the old folks’ maxim that if they’re not talking about you, it means you didn’t bring much to the table in the first place. You could never be, arguably, the most impactful attorney general since Robert F. Kennedy if your name weren’t mentioned as many times in the Senate confirmation hearing of your successor as your successor’s. Even as Loretta Lynch was on the cusp of making history herself as the nation’s first black female attorney general (she was finally confirmed Thursday, after a five-month delay), her two-day Senate Judiciary Committee roast back in January was consumed by “Holder” name-drops—a total of 65 when it was all said and done. But when your adversaries were locked in political hand-to-hand combat with you from the get-go, your status as Washington legend has a habit of speeding past you. By 2015, Holder—always in control, always in stride, always on his swagger—had very little control over that. And what should have been a smooth succession plan for his replacement very quickly turned south and made him the third-longest-serving attorney general in U.S. history, just after Janet Reno—the first woman to be attorney general—and William Wirt. Interestingly enough, as political as D.C. is, and as much as Republicans have tried to portray Holder as political, there’s an argument to be made that maybe he eschewed politics at his own expense. His use for Capitol Hill niceties sometimes stopped at the foot of Republican intransigence. And it all depends on how “political” is defined, since Holder was far from a brown-nosing deal cutter, and more so a happily unsubmissive negotiator. Which is, perhaps, where Holder wanted it. Leave likability to the partisans. Popularity contests are for the electoral prom kings and queens. It wasn’t his job, he figured, to get re-elected; it was merely his job to serve at the pleasure of the elected president who picked him. With that, Holder embraced his recalcitrant-outsider meme, a mix of embattled, angry Boondocks nerdiness perfectly aligned with the quiet muscularity of shrewd administration consigliere. Yet in the end, Holder’s operational philosophy wasn’t necessarily combative or waywardly activist, as his frustrated enemies would characterize him. Once the Holder era ended, we walked away with the comfortable notion that he simply wanted to be the best purveyor of law that he could be. That job, however, was never easy. It clearly wore on Holder in his final years as attorney general. Running the Department of Justice, the most powerful law-enforcement agency on the planet, isn’t for the malleable or mild, especially when you’re prosecuting terrorists, bank lords and hackers. Under Holder, difficult decisions were made: Big banks were fined more than $100 billion by DOJ lawyers, even as populist critics blasted the administration for not jailing recession-causing Wall Streeters. With the president not interested in accumulating more foreign military adventures, he leaned on Holder for guidance on a number of constitutionally thorny war-on-terror topics, from drone use to law-enforcement data collection and digital privacy. With questionable calls, though, on increased prison funding in the recent federal budget request, Holder’s counsel certainly wasn’t perfect. That said, it’s hard running the nation’s federal law-enforcement apparatus during one of the most politically polarizing times in American history. Add a dash of black president and you’ve got a recipe for full-throttled national ignorance on steroids. Holder managed to hold on, however, attempting legacy moves on his stands against voter-ID laws, election-suppression strategies and the dismantling of Voting Rights Act preclearance provisions. It got ugly in the final months of his tenure as dead black men in Ferguson, Mo. ; Beavercreek, Ohio; Cleveland; New York City; and elsewhere forced him to face police violence head-on in ways his boss would not. Even as he worked double time through ambitious investigations and recommendations, Holder managed just enough street cred as the credible voice of reason. Still, let’s not run away from it: At both peaks and valleys, black America gladly clung firmly to the folklore of Holder as a modern-day African-American hero. Somewhere halfway through President Obama’s first term, as the black community eventually acquiesced to the reality of the first black president as Washington mortal, the Holder ethos colored our imaginations the same way black-history heroes adorn murals on brick city walls. This is where Holder discovers some immortality, whether intentional or not: the Brooklyn, N.Y.-born son of Bajan immigrants channeling scraps of Caribbean defiance found in the DNA of greats like Marcus Garvey, Malcolm X and Shirley Chisholm. Not that we can be sure Holder deliberately paved that path. But there was a distinct new-sheriff-in-town tone to Holder’s tenure, and a confident legal voice, born from years as a successful corporate litigator. He knew what he was getting into when he took the captain’s chair at the Department of Justice, and knew who he was dealing with. We found him in one needed, famous “Oh, snap!” moment dressing down the House Oversight and Government Reform Committee chair, Rep. Darrell Issa (R-Calif.), during a nasty 2013 hearing over subpoenaed administration emails. That wasn’t the first time, either. In a way, Holder’s exit is a glimpse into the grief two years from now when the first black family leaves the White House. 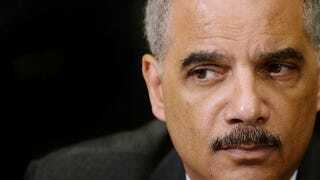 Many believe that Holder was actually the unapologetic “double consciousness” race-man proxy for President Obama, the close, unelected confidant who could do and say in public what his leader-of-the-free-world friend couldn’t. But in so many ways, that doesn’t quite capture Holder’s contributions at a time when knuckle-up, black-man bravery appears in decline. Despite becoming the first attorney general held (unjustly) in contempt of Congress, he managed to relentlessly swat back the incessant buzzing of his opponents. There’s probably little chance that Obama will tap Holder for the Supreme Court as an ideological counterweight to the sole, far-right-leaning black justice, Clarence Thomas—even if he wanted to. (Can you imagine how those hearings would go?) But in an era when so many fools jump on Grammy stages or publicly shame their babies’ mamas, Holder brought an edgy, intelligent, Shaft-like beat back. You could catch him, dressed in suit and tie, enjoying his role as jurisprudential “Blade,” battling back neo-segregationist vampires who now work in earnest toward wholesale reversals in civil rights. For that, he wore all the trouble and partisan insults as a badge of pride. And despite his understandable yearning for a long-deserved vacation, we get the sense that he’d do it the same way if ever given the chance to do it all over again.